Campfire: Can I setup a conference call using Campfire? 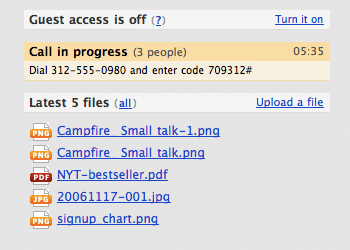 Can I setup a conference call using Campfire? Yes! 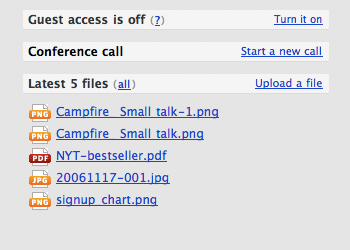 If you have a Plus, Premium, or Max Campfire account you’ll see a “Conference call” block in the sidebar. Clicking the “Start a new call” block will drop a phone number and PIN into the chat room. Everyone in the room will see the number and PIN. The timer starts once the first person calls in (no minutes are used until there’s at least one person in the room). As people start calling in, the sidebar updates live with the number of people on the call. We also list the call on the Transcripts page. If you don’t want a recording of the call you can delete it from there. How many minutes do we get? Plus gets 500 minutes a month, Premium gets 750 minutes a month, and Max gets 1000 minutes a month. Minutes reset on the 1st of every month. Currently we don’t sell additional minutes so if you run out of minutes you can upgrade to the next plan up. If you run out on Max let us know – we’ll keep an eye on usage and consider offering additional minutes for sale if enough people bump into the highest limit. Note: Basic and free Campfire accounts don’t include conference calling. How are the minutes calculated? Each caller uses minutes. For example, if you have a conference call with 5 people for 10 minutes, the call used 50 minutes (5 × 10). If you have a call with 3 people for 45 minutes, the call used 135 minutes (3 × 45). We display minutes remaining on your Account tab. If you run out of minutes on the middle of a call we’ll let you finish the call (we won’t cut you off). While each room can only have one conference call at a time, you can have multiple calls going on at once across different rooms. Each time you click “Start a new call” the system will generate a new PIN. This keeps the calls separate. Note: At this time Campfire conference calling is only setup to use a telephone number local to the Chicago area. While it should still work from your location, long distance calling charges may be incurred.